This qualifies as a “Fatfree Tip” rather than a real recipe. Many of you already know this, but for those of you who don’t, you can make a great, almost fat-free tostada by taking an uncooked corn tortilla and crisping it in the oven for a few minutes. I baked mine at 400 F for about 5 minutes. You have to watch them carefully or they’ll burn, and if you don’t leave them in long enough, they’ll be chewy rather than crispy. But when you get it right, they’re really good–and they contain a fraction of the fat of a fried corn tortilla. 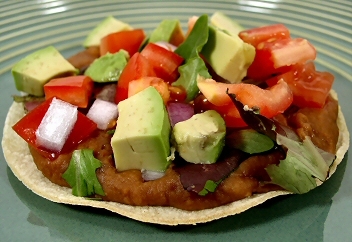 This one is topped with fat-free refried beans, lettuce, tomato, avocado, and red onion. It’s a great meal when you’re pressed for time, and kids love it! I have been trying to eat healthier lately and been focusing on fresh ingredients. This TOSTADA!!!!! Looks sooooo good. I just ate but I want to go make this right now. I would have never imagined how good some of this food would look. PLEASE heep up the good recipes so I can keep eating!! I've done this for other things, but not for tostadas!! Side note–a trick for low-fat nachos/chips and salsa/etc is to toast a tortilla in the toaster oven (or regular oven) like you've specified. I love toasting Trader Joe's Brown Rice Tortillas, as they're gluten free, and they crisp very well. Serving them with salsa is a healthy and delicious snack! I've also toasted Persian Lavash bread (the really flat one) for the same effect—excellent to add to tortilla soup, eat with hummus, or to put in the middle of a burrito for some added crunch. Oh WOW! We had these tonight and they are AMAZING! My new favorite meal to make and they are healthy too! Thanks for posting this recipe! I make these all the time in the toaster oven, and they’re one of my favorite last-minute meals. I usually spritz them with a little fat-free cooking spray, just to make them brown up nicely. Then I cover with black beans (I do a crockpot full at a time, and then use them as needed), lettuce, tomato and a little red onion. Amazing and satisfying! I make tostadas and tortilla chips by microwaving corn tortillas one at a time for 2 minutes. They turn out perfect! For tortilla chips, simply cut the corn tortilla into triangles using a pizza cutter. Thank you so much for sharing – nachos were a hit this evening!!! Didn’t miss the fat one bit. We have these about once a week. My picky granddaughter says they have the right combination of crunch and soft. I am a fan of bean tostadas. I never thought of the avocados but sure that I’ll use them in the future. I use black beans and cabbage rather than lettuce.